Nurturing yourself and your partner is a crucial part of developing a satisfying relationship. Not surprisingly, Ann had a similar hope when she heard Joe pull into the driveway. “Maybe he can take over and give me a break.” After a quick look at Joe, her hopes vanish. If this were the occasional situation, Joe and Ann could stumble through it. But it has become distressingly familiar. They constantly hope against hope that the other can take over and create some emergency relief. Are you a typical modern beleaguered couple struggling to meet the grinding demands of time, energy, children, and limited resources? How can you possibly nurture yourself and your partner when you can barely complete life's daily tasks before you collapse into bed at night? Operate from the perspective of mutual understanding. You and your partner have to depend on each other in so many ways. It helps to understand the other's “core strokes.” “Core strokes” are those words and actions that work best to rejuvenate each of you. They also help you feel loved and valued. Pete loves verbal strokes, especially when Ellyn gives him compliments about doing something well. Ellyn, on the other hand, loves behavior–just clean up the kitchen or make dinner, and she feels very taken care of. In our early years we used to miss the point. Pete would give Ellyn lots of compliments that were meaningless to her, and Ellyn did lots of cleaning that escaped Pete's attention. It's common for people to give what they desire. Both of us felt like we were missing something. Now Pete cleans the kitchen and Ellyn showers Pete with praise about his work skills. In this way we support what is more meaningful to the other person. Start by thinking about your partner and what is meaningful to him or her. This is a significantly different approach from how people usually take care of themselves. It's based on the understanding that in order to get what is important to you, you need to understand the values, interests and strokes that mean most to your partner. Would an evening out with friends be meaningful? Perhaps Joe could stay with the kids while Ann went to a movie, and Ann could give him a massage when she returned home. Take time to identify what is important to you. Identify how you get depleted or overloaded, describe the extent of it, and suggest some corrective action. For Ann to take care of herself, she can't simply abandon her legitimate responsibilities and say to Joe, “Up yours, I'm off to the spa to take care of myself.” No, Ann has to look at the bigger picture and then have a dialogue with Joe to set the stage for a more long term resolution. Prove to yourself that it is valuable and legitimate to take care of yourself. List all the reasons and benefits to taking better care of yourself. The dialogue is between two conflicting internal parts of Ann. One part believes she should, as a good mother and wife, respond to the needs of the family first. There are other obligations as well to respond to, and then (and only then) can she look after her own well being. She has another voice that believes in looking after herself. But this voice is smaller and often gets shouted down by the first voice. Brainstorm all the possibilities of how you might nurture yourself. Ann might go to the movies, take nightly baths, or hire a neighborhood teenager to help between 5 and 7 pm while she makes dinner. Joe might ask for some time alone when he first gets home to exercise and relax. Later he might do kids' baths and bedtime reading while Ann gets a break. Discuss the possibilities with your partner. Ann found a time with Joe to discuss her different voices and brainstorm solutions. She talked about feeling guilty when trying to take better care of herself. And she talked about her resentment when she didn't. Ann speculated that one reason for her chronic feeling of low energy was because of this internal battle. It drained her energy to have two different voices battle constantly for supremacy. Ann speculated on Joe's competing voices to be a good provide and husband and also respond to his own individual interests. She encouraged Joe to do a similar exercise so she could listen to him. Ann continued to discuss her dilemma. She said she hadn't wanted to talk to Joe about her struggles because she saw his own sorry state and didn't want to add to his burdens. Ann was pleasantly surprised at Joe's response. He wasn't upset to hear her conflicts-instead, he felt relieved that she could describe them. Ann was amazed at Joe's response. He appreciated her initiating the conversation because it gave him the courage to express his own dilemmas. He wanted desperately to be a good provider and felt very guilty about her exhaustion. Seeing her so run down made him want to work harder. But working harder also made him less helpful, loving and involved on the home front. He knew he was not being effective but he couldn't break out of the loop and felt too bad to bring it up. He didn't want her to relieve his burden by shouldering more responsibility. 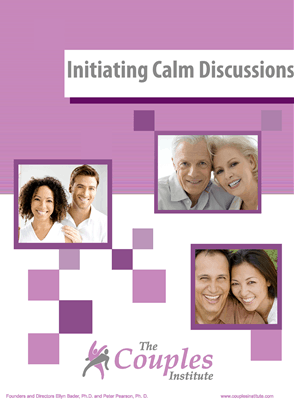 With more conversations, they began to understand their individual regenerators–those activities that helped them feel renewed and revived independent of their partner. One of Joe's personal interests was photography. He loved it, but he felt guilty about putting any time and expense into it. Because of their circumstances, he believed he could not fully develop his hobby for years to come. More than anything else, Ann wanted time alone and to have the house clutter free for a few days in a row. She talked about how she felt coming home to a neat house. When it was in order, the house felt like a home, a place to rejuvenate, a place to relax. She said clutter for her was like the sound of dry chalk screeching across the chalkboard. And guilt free time alone would be like a gift from the gods. She would do what she wanted. Sometimes it would take planning and sometimes it would be spontaneous–but it would be hers to decide. Avoid trying to create solutions until after you have spent adequate time listening to each other. Experience the spirit of discovery as you listen to your partner and begin to understand him/her better. Explore the vital elements that make each of you feel loved, rejuvenated, or appreciated. It's hard to believe, but of all the things people can do to nurture themselves and each other, there's not much that's more effective than genuine, interested listening. This was a good beginning for Ann and Joe. They accomplished a number of important tasks with their conversations. They began to understand the multiple struggles they had. Out of this understanding, they began to see there was not going to be just one solution that covered all the issues they were facing. They began to target the most vital areas for nurturing themselves and each other. We hope you and your partner can begin to understand your struggles and identify the most important areas for nurturing yourselves and each other. For more information on relationships, visit our website at www.CouplesInstitute.com. Extra thank you's, compliments, backrubs, flowers, and date nights often go a long way. Choose what matters to your partner and try lavishing it on them.